Make a donation to the Hoover Institution today, and support the distinguished scholars, leaders, and citizens who proudly advance the cause of individual and economic freedom, private enterprise, Constitutional government, and the American way of life. 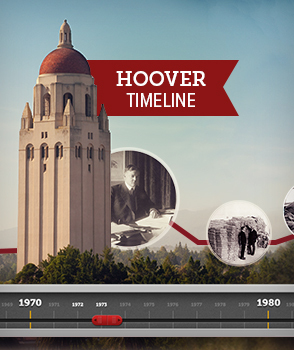 The Hoover Institution will use your investment to inform the national policy debate. By giving to maintain and expand our unmatched library of historical records and archives . . . by supporting the work of our outstanding scholars . . . you will increase your mark on American and world history. You will increase our robust presence within Stanford University, which continues to grow from our founding almost 100 years ago by Herbert Hoover. You will also sustain our new Hoover Institution in Washington DC office, which allows Hoover to have proximity to generate expert policy steeped in knowledge—at a time when Washington urgently needs this perspective. Finally, you will help drive forward a strategic communications program—harnessing the power of print and electronic media to convey to America ideas defining a free society.